Include Celigo in your onboarding processes. Avoid email clutter and attach only those emails end users find important enough to store in NetSuite. Use the Gmail tab in NetSuite (instead of the communication tab) to quickly view all important emails saved from Gmail. Ensure CloudExtend is set up so emails attached to Contacts also attach to the parent company to allow for one holistic view of all conversation at the Parent level. (This can be done at the org level by an Admin). Create records directly from within Gmail instead of going into NetSuite to create them. Create a saved search for KPI tracking. Decide how you want to handle missing senders/recipients (This can be done at the org level by an Admin). Consider using Google Drive as your storage solution. By using Google Drive you are not taking up any NetSuite storage space + all files attached to NetSuite records that are edited/changed in Google Drive will sync in real-time on the NetSuite record! Use Gmail’s native ‘Save to Drive’ tool to save your email attachments to Google Drive. Then click ‘Organize” and place it where you wish. 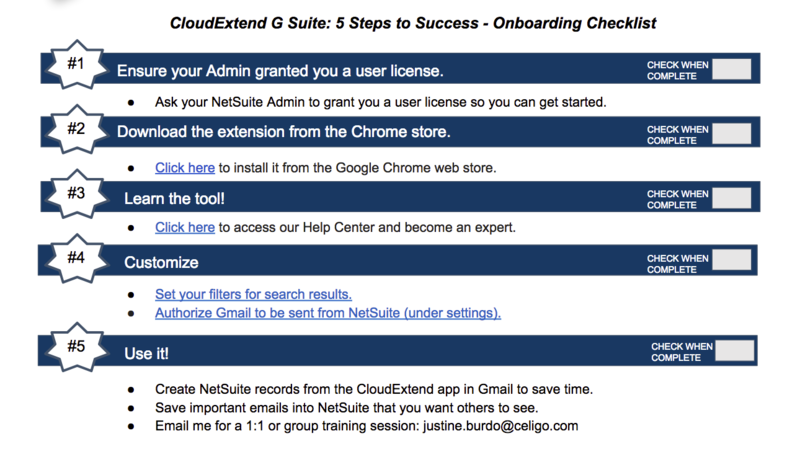 You can then also save the email to the desired record and quickly navigate to the record in NetSuite and use the Celigo Tool to associate the new document with the NetSuite Record on the Google Drive tab. Anytime you save a folder to a NetSuite record and then you or someone else in the company adds files/folders to that folder in Google drive, it will also add the file to that folder that the folder is attached to in NetSuite. Visit our Help Center for more information on all of the above.